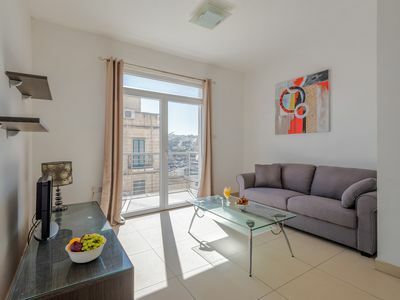 Midmost, location, Sliema, one-bedroom penthouse. This penthouse is the ideal location where one can sit back and relax, enjoy sunbathing and yet being walking distance to any amenity. This penthouse is set on the 4th floor or a brand new building. Served with lift where only a small flight of steps will lead you to its entrance. What makes it unique this penthouse is that it has a very roomy outdoor area which is quiet unexpected being a one bedroom penthouse. At the entrance of the penthouse, there is the kitchen/living area which is very luminous as it has apertures on both sides of the building. On one side there is a spacious balcony where one can hang out clothes to dry and on the other one can find the spacious terrace. As for the kitchen, it comes fully equipped with hob, oven and all utensils one can need as well as four seating chairs with a good sized dining table. As for the living area, there is a 32’’ tv with complementary cable tv and wifi internet. On the other side of the entrance one can find the spacious bedroom which has also a door leading to the spacious outdoor area. As for the bedroom, it is fully equipped with AC. Being quite an over-sized bedroom one can fit in even the 3rd person on a single bed in the same bedroom. The bedroom then leads to an en-suite which comes fully equipped with a shower closure, sink and toilet. 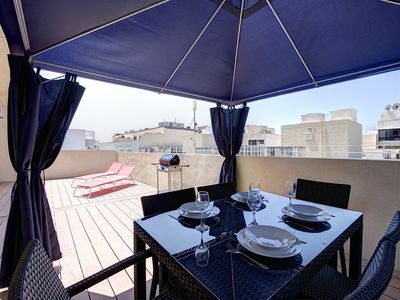 The focal point of this penthouse is the 50sqm of private terrace where on one side one can find the BBQ area with 6 seating area under a canopy and on the other side a sunbathing area to enjoy during the day. All the flooring outside is decked and it makes it even more pronounced. What might be a missing is that one has only street view from the terrace. But the area where it is located makes it paid for that loss as it is only few minutes walk to any amenity. Whether being shopping, eating, pubs or even swimming.